BIGGER ships have sailed the seven seas. But the scrappers have ensured that the fleet of massive container vessels ordered by Denmark’s Maersk Line will be the world’s biggest afloat by the time the first of them is launched in 2013. Maersk announced on February 21st that Daewoo Shipbuilding of South Korea will construct ten of the ships in an order worth $1.8 billion; the Danish company has an option to order 20 more. And if the new ships claim no overall record for size they will significantly alter the economics of container shipping. The three previous ships whose size exceeded that of these giants were all oil tankers. Maersk’s new "Triple-E" fleet will be the biggest container ships yet seen (artist's impression above). They will carry 18,000 boxes, 2,500 more than the biggest container ship currently in service, which is also operated by Maersk. The new vessels will use 50% less fuel per container than the present average. That will be good news for the environment and for Maersk's profitability, as crude oil sails past $100 a barrel. The new ships will ply the routes between Asia and Europe, so the order is a bet by Maersk that China will prosper long into the future and so will its exports. Container shipping has bounced back remarkably quickly from the post-credit-crisis lows of 2009. The recovery in shipping in the first half of 2010 took many in the industry by surprise as China’s resilience was buttressed by growth in parts of Europe—particularly in poorer countries such as Russia and Turkey—and in America. Maersk’s annual results are due to be delivered on February 23rd and should make pleasant reading for investors. That the industry is steaming ahead was confirmed last week by Asia’s largest container line, Neptune Orient. It said it had made $460m of profits in 2010 compared with a loss of more than $740m the year before. This year is likely to be plain sailing too. Shipping rates are rising and Maersk reckons global trade could grow by 8%. Clarksons, the world’s biggest shipbroker, is predicting something closer to 10%. If the future for container-shipping lines looks promising, the same cannot be said for the bulk carriers, despite China's continuing hunger for raw materials. The Baltic Dry Index, a measure of shipping rates for bulk goods such as coal, iron ore and grain, has foundered as container-shipping rates have picked up. The reason, explains Michael Lewis of Deutsche Bank, is the rapid growth in bulk-shipping capacity: the worldwide bulk fleet is expected to grow by 16% this year, double the rate at which freight volumes will grow. Bulk shippers ordered lots of new vessels when China’s demand for raw material sent the index soaring to nearly 12,000 in 2008. But it closed on Monday at just 1,301. The current bulk fleet weighs in at 623m tonnes, with 277m tonnes (ie, 44% of existing capacity) on the order books. Container-shipping order books, in contrast, are back to normal, at around 25% of the existing fleet. Container shipping has fared better because it is far less fragmented than bulk shipping. There are just 20 or so global container carriers: Maersk's container fleet is around 500-strong. The bulk-shipping business, however, has few dominant firms, with most lines owning no more than a handful of vessels. That container shipping is dominated by just a few big lines made it easier for the industry to take out excess capacity in the 2009 downturn and will reduce the chances of reckless expansion now that good times are back. Uma das vitimas mais conhecidas do recente ataque por ransomware. The shipping industry must learn from last week’s cyber attack on Maersk, say analysts, and the line’s chief commercial officer, Vincent Clerc, said the line would “have to ask ourselves some tough questions”. Speaking to CNN, Mr Clerc said the company had focused on trying to restore normal operations, but as the situation improved, it would start to investigate the attack further. It also issued an update on APMT’s terminals, which reveals that Rotterdam’s Maasvlakte II continues to be the most affected, with no rail or marine services, and limited gate services – the terminal is operating at 15% of its normal services. The port of Gothenburg is operating manually, with limited services; Poti, Aarhus and Algeciras are also impacted, while in North America, Los Angeles, Mobile, Port Elizabeth and South Florida are also running manually. Lars Jensen, CEO of CyberKeel and SeaIntelliegence, said some phone systems were still down and bills of lading unavailable in some places. Mr Jensen warns, in a blog this morning, that weak security is endemic in the shipping industry: some 44% of carriers show “signs of low levels of cyber security related to very basic elements”. He notes that one top-20 carrier allows shippers on its e-commerce platform to use “x” as a password. Another top five carrier states that “12345” would be a medium-strength password. Mr Jensen points out that the fact the attack spread laterally through Maersk’s different business units shows that the firm’s level of security was not high enough. iContainers said the industry should heed the warning, adding that IT systems could be hit by something as simple as opening an infected email, so staff should be warned. “After years of low earnings and huge losses, some [shipping lines] may not have been as diligent on their security as they perhaps should have been,” said Klaus Lysdal, vice president of sales and operations. “Maersk stands to lose a substantial amount of money from this attack, which hopefully will spur every carrier to intensify their security measures. “Considering the importance and value of what the industry does, it is ill-prepared for an attack such as this. One would have thought that Maersk was perhaps the carrier with the highest level of protection,” he added. Os futuros Tesla dos mares. 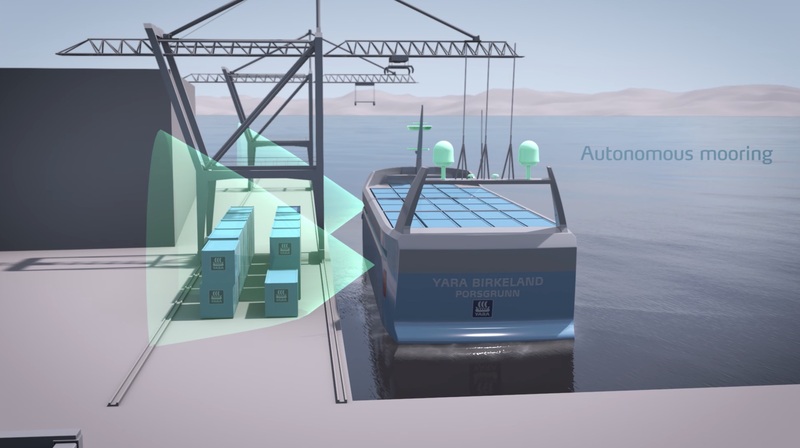 Dubbed by shipping executives the "Tesla of the Seas," the Yara Birkeland now under development is scheduled in late 2018 to start sailing fertilizer 37 miles down a fiord from a production facility to the port of Larvik. Using the Global Positioning System, radar, cameras and sensors, the electric ship is designed to navigate itself around other boat traffic and to dock on its own. 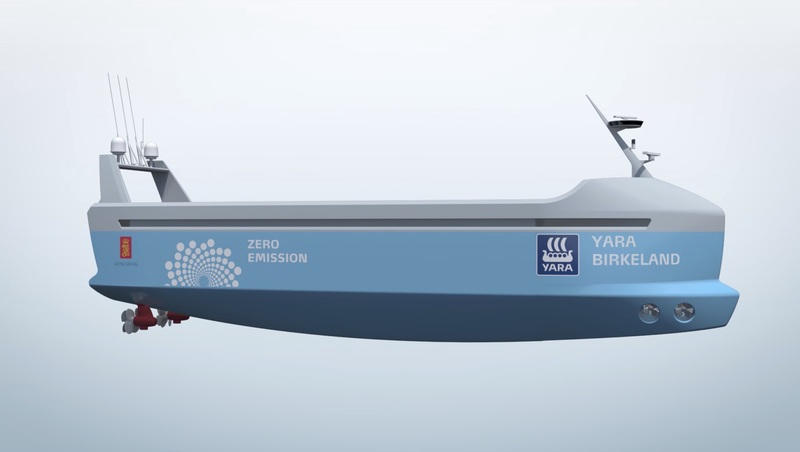 The vessel will cost $25 million, about three times as much as a conventional container ship of its size, but its backers say without need for fuel or crew it promises to cut annual operating costs by up to 90%. The 100-container ship is scheduled to be in the water toward the end of next year, though initially it will be tested with a human at the controls. The Birkeland will become autonomous in stages. At first, a single container will be used as a manned bridge on board. Then the bridge will be moved to shore and become a remote-operation center. The ship will eventually run fully on its own, under supervision from shore, in 2020. "When the bridge goes on land, it will be something like flying a drone from a command center," said Kongsberg's chief executive, Geir Haoy. "It will be GPS navigation and lots of high-tech cameras to see what's going around the ship." O paradigma dos combustíveis e dos humanos aos comandos dos veículos está a mudar e o conceito de navio fantasma também terá de ser revisto, isto porque já no próximo ano poderemos ver a cruzar os mares e oceanos navios que não necessitarão de ter tripulação para navegar. Serão embarcações totalmente autónomas. O Yara Birkeland deverá começar a navegar já em 2018 e, inicialmente, terá como missão entregar fertilizantes ao longo de uma rota de 37 milhas no sul da Noruega. Em primeiro lugar, este será operado por uma equipa de bordo, depois remotamente, antes de se tornar totalmente autónomo até 2020. Isto deverá ser acompanhado pelas regras marítimas que, com o tempo, deverão ser igualmente lançadas para reger a forma destes equipamentos operarão nos mares, isto porque ainda há carência deste tipo de leis e regras. O Yara Birkeland está a ser desenvolvido pela empresa agrícola Yara International e pelo fabricante de sistemas de orientação Kongsberg.